Housed in a brick building situated by a waterfall in the picturesque town of Brandon, Vermont, is the studio of Warren Kimble, a man commonly billed as “America’s best-loved contemporary folk artist.” Step inside and you are transported to a whimsical world where pigs take flight, red barns perch on brightly colored patchwork farms, and everything is as American as apple pie. 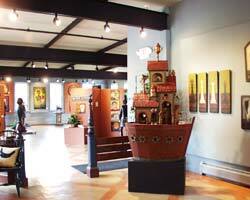 Ask us about Warren Kimble Art or share your Vermont artist comments. To feature your Vermont Artwork, contact us. Born in New Jersey and educated at Syracuse University, Warren Kimble began his career as an art instructor and eventually joined the art department of Castleton State College in Castleton, Vermont. Painting was always his passion and in 1983 he left Castleton to paint full time. The combination of his distinctive style, rustic color usage, and optimistic subject matter won him critical acclaim and a broad fan base. Today his licensing contracts bring in over $100 million yearly, and have made him one of the country’s most successful artists. His success has been shared with his adopted hometown of Brandon, where he has made his home for over 30 years. 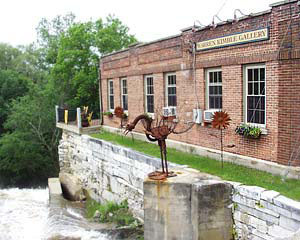 In 2001 Kimble purchased the Green Block, an older abandoned building next to Neshobe Falls in downtown Brandon. The building was razed and in it’s place Kimble created a park named Brandon Green. The park, which sits adjacent to his gallery, is a relaxing place where a visitor can get an up-close view of the falls, or admire the handsome profile of Brandon’s downtown. The studio houses Warren Kimble’s gallery and everything, from the checkered floor to the ceiling, seems to have been a pallet on which he could paint. Many original works are on display, and the studio sells signed prints, stationary and home decor items, all with Kimble’s Americana touch. Open year round, the studio known as Kimble House is a delightful trek into the unexpected and welcomes visitors daily. Lodging options can be found in Brandon, or in nearby Rutland or Killington, making a visit to Kimble House a conveniently located part of a central Vermont vacation. NOTE: On January 1, 2006, Warren and his wife officially retired from their retail business. On February 12, 2006, Warren and Lorraine Kimble were treated to a couple of surprises by their friends, family, and community members. An afternoon gathering was held that was open to the public. The Kimbles were honored by the Town of Brandon. 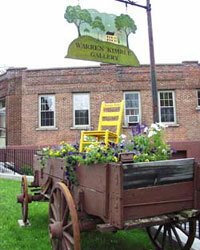 In May of 2006 – Warren and Lorraine Kimble vacated their downtown gallery/studio and the building has changed hands. The space is now a decorator’s shop.